Cobra H5024V - Powered by a 24v Lithium-ion Battery. Double sided cutting blade - Precise cutting every time with Cobra. The H5024V cordless hedgetrimmer from Cobra comes with a 50cm double sided reciprocating cutting blade, with a large 15mm tooth spacing. Double sided blades are more suitable for shaping, as you can alter the direction of the cut without moving around as much and with its extra versatility, the H5024V hedgecutter is perfect for domestic gardens. Eco & Turbo Mode - Feature rich Cordless Hedgetrimmer. Ergonomic Controls - Intuitively Positioned Operator Controls. 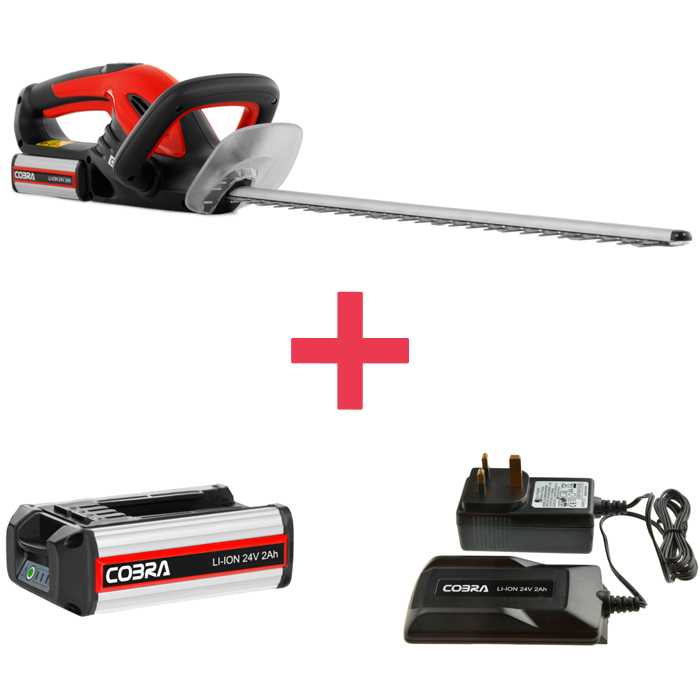 The Cobra H5024V cordless hedgetrimmer has been designed to make trimming your garden a simple and effortless task. The ergonomically positioned controls not only makes operator use more comfortable, but gives greater manoeuvrability.